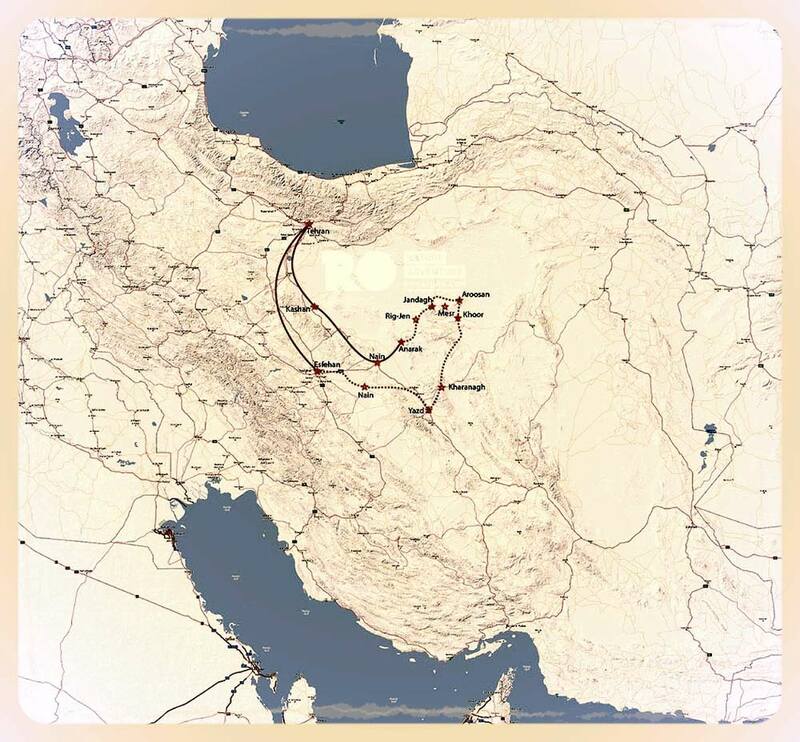 Exploring both nature and culture of central desert of Iran will take us all the way into one of the deepest and most pristine deserts which has not been crossed by humans until a few years ago. We will experience why Rig-Jen desert was abandoned during history. Depending on the starting point we can visit Nain and Anarak. Then we will get into the dunes of Rig-e Jen desert which has not been crossed by humans until 2009. Locals believe that it is roamed by Jennies. So we will figure it out by exploring different micro climates in this desert for 3 days. Accommodation is camping and the food will be prepared by our chef. On the third evening we will arrive at a local house bordering the desert for a taste of local hospitality. We get a chance to refresh and prepare to ride into the next desert. After a short walk in the green farms between the dry lands, we continue our journey to the desert named “Mesr”, which means “Egypt” in our language. A few hundred years ago, a camel driver came to this side of this desert to find his lost camel. When he saw the beauty of the place, he said “I will make my own Egypt here”. So he started to dig a Qanat for 5 km to bring water to this area and build a small village in the name of Mesr. This village was destroyed by a flood a few years ago. The beautiful desert in this region is named after the village. During our 2 days´ expedition, we pass through some small oasis which still bear traces of old desert architecture. We will do one night of camping and the second night we will arrive in Garmeh. This village has the biggest palm gardens in the region and is the beautiful home of the pioneer of traditional local accommodation in Iran, Maziar AleDavood. We will stay at his Ateshooni House for the night. After a morning stroll through the palm gardens and the water cave in the village, we head to our next desert destination. It is again a unique and different place, so we keep it as a surprise for you to enjoy. The day before we arrive in Yazd we visit one of the ancient villages on the way. Kharanagh and its fortress-like 4-stories architecture is at least 3000 years old. Upon request of our guests, we might visit the Zoroastrian temple of Chak-Chak before we bring our guests to their hotel in Yazd. You are required to pay a refundable deposit of 250 per person per trip for your booking to be confirmed. We will do four night of camping and two nights in traditional local houses. These houses are two of the most beautiful traditional houses in desert regions of Iran. In your trip we use private Fully equipped 4X4 safari vehicle for 7 days.